Greetings, I am Archangel Raphael, I come forth to you with my Angelic Healing Team (https://www.omna.org/angelic-realm-archangels-and-angels-list-of-ch...) to share wisdom and high vibrational healing transmissions. I wish to encourage you to ask for healing from me, Archangel Raphael, my Angelic Healing Team, and in truth any guide you resonate with upon the inner planes. Asking and requesting healing for yourself is now essentially and especially important because healing is not only a transference of energy or a physical aid - it also develops your connection with the Creator Ashram (https://www.omna.org/the-creator-list-of-channeled-messages/), and also allows you to better uplift the lives of others. As you ask for healing, whether out loud or in your mind, you are creating a pillar of light that flows from the inner planes into and through your being. The more light you anchor into your being the easier it will be for you to manifest and experience the qualities of the Creator within you. You may use one or many of these invocations to aid your connection with me, Archangel Raphael, and the Creator. I will support you in receiving an appropriate healing and a deeper connection with the Creator. The Creator realised within my expression and energy, Archangel Raphael, the quality of healing, caring, and the ability to help and enhance one's soul connection and evolution. Helping and caring for people is in fact one of my many purposes; sharing the most essential energies to aid their growth. We can now see that every soul has the ability to heal because every soul can, if they wish to, devote themselves to caring for themselves, and caring and helping others through the process of anchoring the Creator’s energies of acceptance, transformation and love. I feel this message is very simple and yet vitally important because it helps you to realise how easy it can be to embody the light of the Creator, creating transformations in your life and the lives of others. Video - "A Greater Purpose To Accepting Healing By AA Raphael"
There is a greater purpose to my current communication and encouragement of you requesting healing for yourself. My purpose is to alert you to the transformation that is available to take place within humanity through the simple process of requesting healing. This transformation is the shifting and rebirth of your energetic vibrational pattern especially, at a physical body level. Humanity has created a template of existence through their thoughts of how a physical body manifests on the Earth, generating this over many generations and civilisations. It is akin to a knowledge or understanding of human life that is embedded into the physical form and consciousness of a human passed down through generations. These simple beliefs dictate the appearance of a person, how they should act and react, what is available and possible for them on the Earth and in truth most things that every person experiences on the Earth. It is akin to DNA - information, characteristics, features and mannerisms passed through generations. Of course, every physical person is different, and the soul can influence the manifestation of their physical body depending on the lessons they wish to learn. This template has evolved and changed and yet all humans hold the same consciousness which manifests within their physical bodies. With more people awakening and the vibration of the Earth quickening, the information, template, or coded consciousness within each physical being is no longer appropriate or relevant to the current day ascension. This has been transforming for some time now, however, I, Archangel Raphael and my Angelic Healing Team wish to boost, transform or upgraded humanity’s template of existence held within their physical bodies in order for their physical bodies to equal the light of their souls. Many of you are already experiencing and receiving updates to your energies and the consciousness of your physical body. It is important to realise that this needs to happen on a mass scale. I, Archangel Raphael wish to support the release of pain, strives, suffering, negative thoughts and false beliefs held within the consciousness or cellular structure of the physical body of all, starting from current reality, and from generations ago. Now is the time to release old energies from the physical body and allow a new higher positive vibration and consciousness to anchor to support your soul’s development. If your physical body’s particles, cellular structure and physical manifestation hold a lower vibration - then this will only ensure your vibrations remain at a lower level. By increasing the vibration held within your physical body, you allow yourself to link into higher dimensions and assist in releasing the limitations and cloak of fear that obstructs and weakens humanity. Currently when people on the Earth are asking for healing, with the permission of their soul, we, the Angels and Archangels work with the energy of their physical body to allow fears and limitations from their own reality and that of the generations before them to be released, bringing a greater freedom to their energies. This manifests an improved health and vitality, a renewed vibrancy to their body and its function on a physical and spiritual level. It is simply a healing with focus on the physical body and releasing old energy patterns. This practice enables the person to create a consciousness within their physical body and cellular structure that is appropriate for them, gaining a greater sense of mastery. ‘Archangel Raphael, Archangels and Angels of Healing, my beloved guides and the Creator, I call upon your sacred presence, support and protection. Please balance and prepare my energies so I may be open to converting the consciousness and light vibration of my physical body. I ask that you now channel the pure and blissful angelic and Creator healing energies into my energy and physical body. Please help me to accept a higher vibration of light, a purer vibration of love and a new positive consciousness, anchoring this deep into my physical body, flesh, bones, blood, organs, DNA and cellular structure. I ask that all negative past programming, consciousness, beliefs and fears stored within my body from previous generations on the Earth and from my current lifetime on the Earth are dissolved, released now with ease and perfection. Please assist this conversion of energy within my physical body, ensuring that this is a gradual process of peace and increased perfect health. Please anchor into my being and energy your support and assistance. Take time to imagine, sense or acknowledge the healing, rejuvenating and activating light flowing into your physical body, and sit or lie in peace until you feel the process is complete. It is beneficial to practice this each day for 14 days in order to allow the transformation to occur within your physical body. It is important that over the 14 days of transmuting any negative vibrations and embodying positive vibrations that you invoke the Angels of Love from the angelic level to surround you and to channel their pure energy of love deep into your being. Ask for this at least three times a day, as it will ensure that you are supported and held in love, allowing all negative energies or consciousness to be released instantly and converted into love of the highest vibrations. This healing process is naturally occurring to those who are calling on healing from their guides and the inner planes, however, to focus your intentions on this healing and activation process will boost your spiritual growth and allow your physical body to become a supportive energy to your development on the Earth. It is a step forward to ascension, mastery and a greater integration with the soul of the Creator. Video - "The Healing Chambers of The Archangels Are Here For You Now"
As you evolve into a being that is consciously connected with the subtle realms, it is important to embody that within your human experience. You are working to establish a strong inner connection, your inner stillness. From that strong inner connection, you interact with the world around you in a different way—through empowered Love. Discovering your inner stillness creates a connection point. With practice, you notice an increase in your intuition, your understanding, and your creative flow with life. While this inner connection increases your ability to interact with the subtle realms, most importantly, it changes your human interactions. That is how you create change in your physical realm. As you interact with others, the way to practice that stillness with interaction is to listen. Listen. 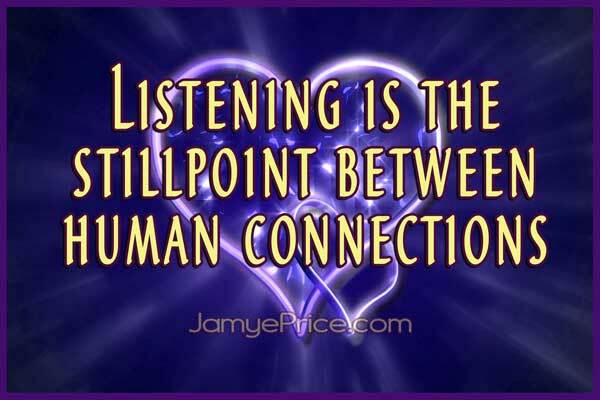 Listening is the still point between human connections. It is where you genuinely receive the energy of another. For some, the energy of listening has become confused with obedience, or lack of choice. Unconscious patterns of disconnection in communication have been created in order to maintain a sense of power. Listening is for those that feel safe enough to expand. Sometimes expansion means giving up something that felt familiar and safe. Listening is for your personal, internal expansion. It is not a mechanism of agreement, it is a mechanism of connection. How often do you speak and yet not feel heard? Many times in conversation, one may not be speaking in the moment, yet they are not truly listening either. They are preparing a rebuttal, relating information to the self, or thinking about something different altogether. When you listen deeply, you will hear much more than the words that are said or even the body language. You will begin to hear the Love—the essence of another being wanting to come forth into the world. Currently, many people interact from fear or wanting fulfillment that they do not know how to fulfill within. Consequently, there is a push and a pull from them that can become painful, tiring, annoying or frustrating. It tests your inner strength not to be pushed or pulled by the outside world. But for one that listens, that Love is expressed. It is silent. It may or may not look pleasant in the moment, but it is Love expressing. It is Love calling forth to be strengthened within. Your inner connection is a connection into the infinite self. That is the infinite well-spring of Love that creates, and it is within you. As you nurture your inner strength through stillness, the push and pull of another does not push or pull you off balance. It meets the soft flow of your emotion. It is the difference between putting your hand into a wall, or putting your hand into water. As you listen and interact with an inner strength of stillness, you are flexible like the water and not shocked by the force, the push/pull, of another. When another human meets your inner strength of Love, they are interacting with a being who feels nurturing and replenishing. You are just flowing along like water—responsive to Life, but not imbalanced by others. That is the difference of empowered Love. You will discover that as you observe things going on around you, you will be hearing into the fears that push and pull humanity. You will be holding your safe shores. That responsive sand that allows the flow to occur. You will recognize that your awareness has more of a stabilizing energy flow to it. Things will begin to shape around you in ways that may not be obvious to another, but because of that internal strength and that connection that you now have with your infinite self, you will see the patterns forming. You are listening to Life. You will recognize that though you have not tried to control someone into a pleasing behavior, they begin to become it. You will begin to see clues of your focus coming to fruition. As you observe the biggest challenges that humanity is experiencing now, you will also, if you look and listen closely, be able to find its opposite, its solution. Your inner strength is beginning to affect the world more directly, though this is invisible at first. It is not all on your shoulders, it is for each to create. Yet it is natural to humanity, for you are truly connected. This time right now is offering you such support as you change. That is what these times are, wonderful exercise as you work your inner stillness into more strength. Listening connects your inner strength of Love to the outside world. As you strengthen within and control your inner realm, it will not feel as if it is controlled, it will feel as if your Love is unleashed. That is how you recognize your inner strength. Not because everything is perfect, but because everything feels invigorating, even in challenge. That is your creative movement at play. Play. That helps you enjoy this process and keep your movement flowing. As you play with these waves of Life, you find the flow of these waves moving you along. Instead of feeling pushed or pulled, you feel incredible movement, knowing the soft sands of safe shores are available to you. It is just a little beneath the wave that you are riding at the moment. These are exciting times, and your drive of creativity and connection is part of what is helping you to begin to shape your inner world more. Life is eager to respond to your creativity. Connect with it. Listen to it. Find your still point of connection within. Life will meet you there. The challenge is to know that our life has power and merit when we are looking at appearances that may not please us. But that's when we start flexing our spiritual muscles — to balance our emotional states and to see beyond appearances to know that there is a blessing in every situation. It's not only a blessing, it's a call from our souls to notice that we have an opportunity to create something wonderful that really works much better for us. When I make new choices from a higher perspective, from a place of multidimensionality, the path takes on a more enhanced aspect, with many more opportunities for the kind of creativity and expansion that I love. I have found that everything I love raises my vibrational frequency. That is really fun, because these empowered frequencies include really simple things like music, nature and beauty. All the things I love become qualities of consciousness that uplift and inspire me, thus changing my vibrations and making it possible for me to have more of what I want to experience in life. This very basic Law of Attraction principle is always valuable to remember. When we celebrate life in all its myriad forms, it honors the Presence that lives in and through us, blessing our path. The uplifting of our thoughts and feelings to the ultimate truth of our existence is a substantial step forward to the recognition that our life is a true gift. We need to show up for our path in life with all the support and intention that we can muster, as well as all the resources we have within us. We have had many attitude adjustments and learned many new skills and spiritual tools in this life that we can apply to creation of the most beautiful world we can imagine. Our imagination helps keep us expanded and inspired so we can incorporate the support from the Angelic Dimensions and all the help we have around us. When we keep our intentions clear and our focus strong, we are walking as blended beings in a greater world that has yet to recognize this imperative. Our Souls know that this is what we are here to do, and our path is celebrated in the heavenly realms. We are being gifted with so much love at this time. This real and practical multidimensional support is a blessed gift that we are here to experience right now. This does not mean that your emotions do not exist, or that somehow you should not feel upset, because in human terms your experience is very real and your feelings valid. Within the power of your soul, however, there is a great gift in every situation. No matter how senseless a condition may appear to your human eyes, a greater truth is available. It can assist you to remember this and to pray to see it. It can also help to remember that you live in a benevolent universe where the grace of God is available at all times. From a human perspective, it is also often difficult to experience incredible joy and happiness. There are many in your world who say, "it's too good to be true, watch out when things get too good," etc. etc. The Angels say to you that you are a beloved child of God who deserves to be happy and to have incredible blessings in your life. If this is what you are experiencing right now, enjoy it. Live this blessed moment to the fullest. Never doubt that good things happen, and that joy and miracles are the natural state of being.